(Newser) – On Wednesday Vice President Mike Pence will officially welcome Doug Jones into the U.S. Senate, bringing to an end one of the strangest and most controversial elections in recent memory, the Hill reports. 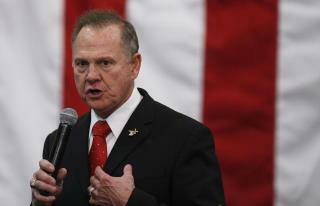 And while Jones' former opponent, Roy Moore, is still refusing to concede the race, Alabama state election officials have released information about the more than 22,000 write-in votes that helped to dash his hopes. The man Moore beat in the Republican primary, Luther Strange, got some small revenge, beating all other write-in candidates with 7500 votes, the Guardian reports. Meanwhile, Lee Busby, a former aide to current White House Chief of Staff John Kelly who was running as an independent, won the write-in battle in at least 10 counties. In all the elections Roy Moore has lost, he has never once conceded. Don't expect the narcissistic horse riding old cowboy to start now. 235 million eligible to vote in America, about 2.5 million in Alabama so 'write in's' of less than 2500 doesn't even equal 1/10,000 of the Americans in Alabama. MEDIA want you to be impressed because they can spell Bugs Bunny or Jesus. I wish I could put a write-in for Hillary. Old Nag.